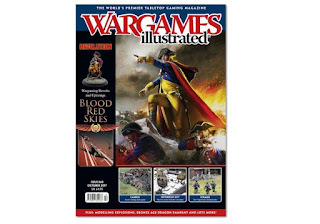 The October 2017 issue of WI features an article I've written about building a Northern European Bronze Age warband for Dragon Rampant. You can read a taster for the article HERE, but Dan at WI has done a great job of choosing superb photos to accompany the expanded text I've written - so check it out if you fancy seeing some photos of the cracking Wargames Foundry miniatures designed for this period of history (and, in my case, fantasy)! Dan Mersey adds a number of new lists for using North European Bronze Age armies in games using his Dragon Rampant rules from Osprey.